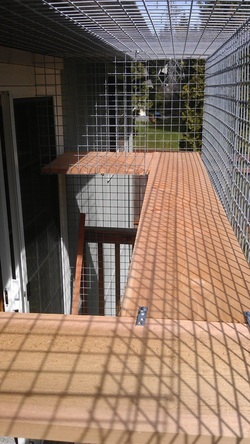 The basic elements of every pet enclosure are the sturdy wire mesh walls. They provide the safety you are looking for. But there's a lot more to it. Our outdoor enclosures are not just a cage, but a cat or dog play pen, an extra room with walkways on various levels for your pet to explore, with resting areas, toys, and the various accessories that make this a space that's fun to be in. Doors: Typically, your pet enclosure is connected to the house in some way, either directly through a pet door installed in a wall or door, or via a tunnel from a pet door to the enclosure. There are commercially available pet door inserts for sliding doors and windows to give your pet access to the outside. Depending on the circumstances we can also insert a pet door into your window screen or into 1/4" acrylic to be inserted into your window screen opening. Tunnels, Stairs, Bridges: Our construction is only limited by your imagination. We can design an outdoor experience for your pet with tunnels to roam your back yard, bridges to connect different smaller enclosures, stairs to move from one level to another. Awnings: To protect your pet from the sun or the rain, we can install an awning over the wire mesh roof. If you prefer fabric, we use a marine grade fabric typically used for sail covers and awnings to protect your pet from the elements. Alternatively, we use polycarbonate or metal roofing materials. Cushions: We custom-make cushions for your pet to snooze on made from the same water-resistant material as the awning (with a soft comfy filling).